Vine’s fast-becoming a place that houses funny and entertaining content from a range of different artists, and now the Twitter-owned company wants to help you keep with your favorites via push notifications. The six-second video app now lets you get notifications to your phone when an account uploads new content if you click the new star on the right-hand side of their account profile page. In addition to a push notification, the new content will also appear in your activity feed — that’s useful as it lets you look over the recent ‘highlights’ from your favorite accounts in one place. Adding push notifications is good for users, but it’s even better for Vine artists who have a much more effective method for ensuring that their content is seen by as many viewers as possible. That’s opposed to hoping that the videos don’t get lost among the noise in their followers’ feeds, as happens all too often on Twitter or Facebook. Earlier this summer, the app added loop counts — to give users an idea of how popular their clips are, and help artists provide clear value for brands and sponsors who pay them for promotion via the app. Thanks to loop counts, Vine artists should be able to tell how effective push notifications are for drawing in more viewers — and it is likely that the answer is very effective. 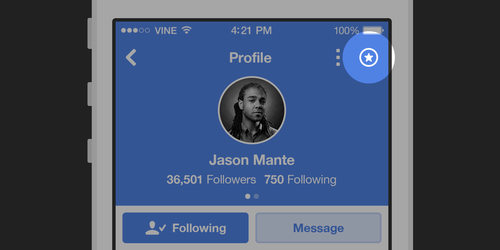 Vine has been doing more to help increase engagement and keep users sticky of late. Back in October, the app began allowing users to follow whole channels of artists with just one click, and today’s update could be another boon to those who make money or enjoy a large following on the service. The new push notification option just rolled out to the Vine apps for iOS and Android today.